What is st. john's wort? Why do we need it? Also known as klamath weed, St. John's wort is a small, flowering plant found in Europe and the United States, particularly northern California and southern Oregon. The typical St. John's wort has small, oval-shaped green leaves and bright yellow flowers. The aerial parts of the plant (flowers, leaves and stem) are used in herbal preparations. They are gathered during the plant's flowered season, then dried and crushed or powdered for use. St. John's wort has been used for centuries to treat a variety of ailments. In ancient Greece, healers used it to treat everything from sciatica to snake bites. In Europe, it was originally applied to the skin to treat wounds and burns, and to facilitate healing. Today, however, St. John's wort is used primarily to treat depression. Several studies have shown that St. John's wort works as well as many pharmaceutical-grade antidepressants, but with far fewer side-effects. It appears to do so by inhibiting the uptake of several chemicals called neurotransmitters, including serotonin, norepinephrine and dopamine. The primary ingredient responsible for this action is believed to be hypericin. How much St. John's wort should I take? For the treatment of moderate depression, many health care providers will recommend between 500 and 1000 milligrams of St. John's wort per day, with results evident in as little as two weeks. For more severe depression, higher intakes may be used, but only under the supervision of a health care professional. What forms of St. John's wort are available? St. John's wort is available as a dietary supplement in a variety of forms, including pills, powders, capsules, and liquid extracts. It is sometimes combined with other vitamins and nutrients as part of a larger supplement. What can happen if I take too much St. John's wort? Are there any interactions I should be aware of? What precautions should I take? Compared to many prescription antidepressants, supplementation with St. John's wort shows far fewer adverse reactions. 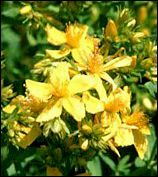 Among the common side-effects noted with St. John's wort are upset stomach, disturbed sleep, and skin rash. St. John's wort may also cause photosensitivity in some individuals, especially those who experience rashes or get sunburned easily. There is some evidence that taking St. John's wort can induce episodes of mania in people with a history of bipolar disorder of hypomania. Patients with either of these conditions should avoid taking St. John's wort. Some medications react negatively to St. John's wort, including (but not limited to) digoxin, cyclosporine, benzodiazepines, sertraline, warfarin, oral contraceptives, and some chemotherapy medications. Patients taking these medications should not use St. John's wort. As always, make sure to consult with a health care professional before taking St. John's wort or any other herbal remedy or dietary supplement. Chatterjee SS, Koch E, Noldner M, et al. Hyperforin with hypericum extract: interactions with some neurotransmitter systems. Quart Rev Nat Med Summer 1997;110. Ernst E, Rand JI, Barnes J, et al. Adverse effects profile of the herbal antidepressant St. John's wort (Hypericum perforatum L.) Eur J Clin Pharmacol 1998;54:589-94. Gruenwald J. Standardized St. John's wort clinical monograph. Quart Rev Nat Med Winter 1997;289-99. Moses EL, Mallinger AG. St. John's wort: three cases of possible mania induction. J Clin Psychopharmacol 2000;20:115-7. Woelk H. Comparison of St. John's wort and imipramine for treating depression: randomized controlled trial. BMJ 2000;321:536-9.